After twenty years selling motorcycles, Kelly McCarthy describes Cascade Moto Classics as "a hobby gotten way out of hand." McCarthy leans against his T-100 Bonneville as traffic breezes past on SW Farmington Road in Beaverton, Oregon. He credits his business' success to a 'Mom and Pop' mentality. "We depend upon repeat business. Our customers come first. 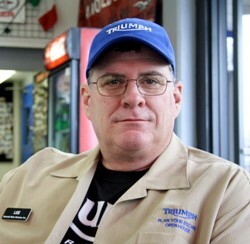 These days it's getting harder to get good customer service with the larger motorcycle stores." Cascade Moto Classics began in a garage in 1988 when McCarthy and Tom Ruttan traveled around the country buying old inventory and restoring Triumphs. Eventually they outgrew their garage and bought Cascade Classic Cycles. McCarthy tended to the shop during the day and was a paramedic at night, while Ruttan worked in high tech industry and in the shop at night. McCarthy's wife, Janice, filled the gaps. City officials knocked one day and said there were problems and the business wasn't properly zoned. They moved into a farmhouse from 1992 to 2001 and when Triumph came back to the US, "We were one of the first dealers," explains McCarthy. "95-00 were pretty quaint - we had a 400 square foot showroom floor if we asked everyone to stand outside." 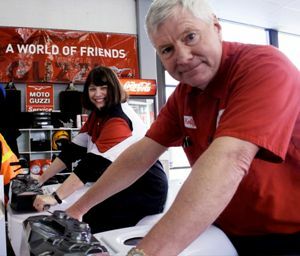 Wanting to focus on modern bikes, the McCarthy's spilt from Ruttan and moved into the old Destination Harley-Davidson dealership, where the shop sits today. "The site was grandfathered in, but these days it would be impossible to get a shop here," explains McCarthy. "Triumph has two faces," explains McCarthy. "There is the sophisticated, wicked fast sportbikes like the 675 and Speed Triple and then there are the Bonnevilles." "Some people didn't like the liquid cooled-triples and in 2001 Triumph re-introduced the Bonneville. Today 60% of our sales come from the Cosworth-designed Bonneville," explains McCarthy. "Doesn't shake, break or leak." Triumph's ultra successful line of 675 and 1050 engines has allowed Cascade Moto Classics to sell over 150 units in 2007 with a little help from Moto Guzzi. "Moto Guzzi approached us in 1992 and 'made us an Italian offer,'" explains McCarthy. "One you can't refuse." In December of 2004, Piaggio purchased Aprilia, which owned Moto Guzzi at the time. The event was seen as a way to improve distribution and accessibility of parts. "We are praying that this is going to turn out like Ford buying Jaguar," McCarthy explains. At a recent open house at Cascade Moto Classics, Lee Holzhey sits in a patio chair knowing his job is done. "I do the stuff behind the scenes to make sure the beer is cold," explains Holzhey, Pack Leader for the Triumph riders owner group known as the RAT Pack [Rider Association of Triumph] and formerly TRAP [Triumph Riders Association of Portland]. While RATs are running around helping customers or answering phones, Holzhey stresses the club has no hierarchy. The pack meets the 1 st Saturday of every month at the Peppermill Restaurant to talk about bikes over an eight-dollar buffet breakfast. All bikes are welcome. 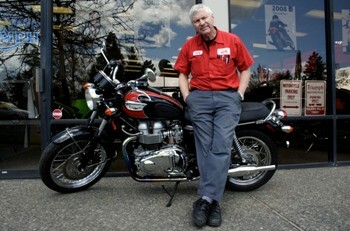 "Cascade Moto Classics is a Triumph Premier Group dealer," explains Mark Kahapea, a former west coast Triumph salesmen. "They have a loyal RAT Pack and customers rave about the end of year Christmas party." To be a Triumph Premier Group dealer means the company has exceeded sales in clothing, accessories and bikes, while achieving top scores in customer service and participation in Triumph events, like Sportbike Northwest. "Motorcycling is rarely a transportation/utilitarian event. It's an emotional connection. That's why Triumph is successful and that's why we are successful," explains McCarthy. Customer loyalty is a big reason why Cascade Moto Classics is consistently in the top 20 Triumph dealers in the nation. A RAT member was cleaning up after a recent event at the store. When asked why he helps out, he turns and responds, "Janice and Kelly are such nice people. Besides, I am here to support my brand and dealer." Janice and Kelly racing on the instore video games.